Includes an internal memory for over 16,000 data values. THE versatility of Synotronics’ SynoLog makes it ideal for winery temperature monitoring applications. The SynoLog temperature logger can be used for grape receival, fermentation, storage and maturation of the wine, just by using different probe combinations or standalone. 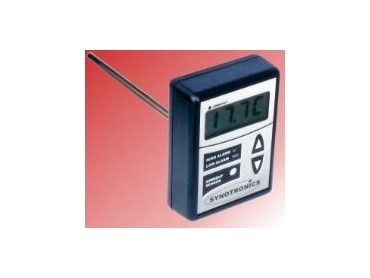 The Synolog temperature logger has a large temperature readout for active temperature monitoring on the run and an internal memory for over 16,000 data values, which can be downloaded later to a computer. With a digital temperature probe interface, the logger can be plugged into individual SynoProbe temperature probes without the need for re-calibration for the new probe. Each probe has its own serial number that is identified by the SynoLog temperature logger and recorded in the memory. This enables a user to place probes throughout a winery and carry the SynoLog unit to sample and record temperatures from each probe individually. A case study of a winery using analogue temperature displays for temperature monitoring in tanks was investigated. It was found that by placing digital temperature probes in each tank instead and carrying one SynoLog unit through the winery to sample each probe – is a significant cost saving. There are also the added benefits of the temperatures being saved in the Synolog temperature logger and the increased resolution and accuracy of using a digital display to monitor the temperatures. Temperature probes available include a 1m pistol grip probe, 6cm-1m tank probes and barrel bung probes. Other custom solutions can be made at a cost effective price to suit every aspect of the winemaking process.